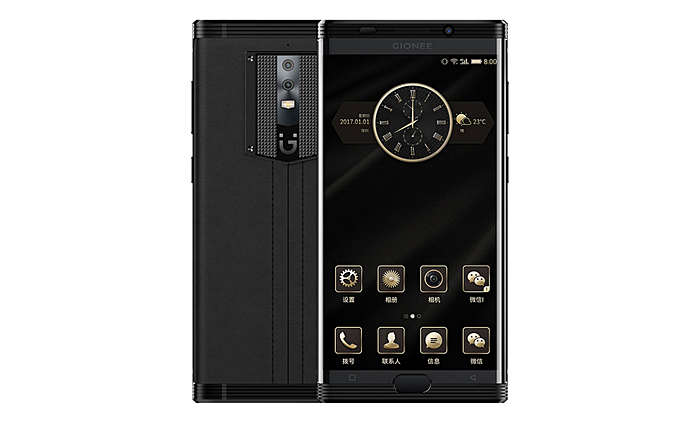 As scheduled, Gionee has officially unveiled the M2017 smartphone. The selling point of the phone is the mammoth 7,000mAh battery capacity it offers - there are two 3,500mAh batteries inside. As for other specs, the phone is powered by Snapdragon 653 SoC, and sports a 5.7-inch display of 2560 x 1440 pixel resolution. RAM is 6GB, while storage options include 128GB and 256GB. There's, however, no microSD card slot. A 3.5mm headphone jack is missing as well. In terms of camera, the handset features a dual rear setup (12MP + 13MP), and an 8MP front shooter. Measuring 155.2 x 77.6 x 10.78mm and weighing in at 238g, the M2017 runs Android 6.0 Marshmallow with Amigo 3.5 UI on top. The phone features a fingerprint sensor on the front. The device has been unveiled in China, where it carries a starting price tag of RMB 6,999 (around $1,010). The top model - that sports an Italian custom alligator leather back - carries a whopping RMB 16,999 (around $2,446) price tag. There's currently no information on if and when it will be available outside of China.